The coffee industry would have you believe that the word “latte” means “espresso with steamed milk.” That basically is what “caffelatte” means, but “latte” just means “milk” in Italian. A tea latte is every bit as much a latte as a coffee latte, and the growing popularity of masala chai lattes has been bringing that point home to coffee drinkers of late. In the coffee world, a latte is typically made by preparing the espresso, mixing in the milk, and then adding foam on top. The milk is there to add flavor and to cut the espresso so it doesn’t taste as strong. In the tea world, the milk serves a somewhat different purpose. For the record here, I am not talking about Starbucks-style chai lattes, which are made with a sweet syrup. I’m talking about tea that’s fresh-brewed in milk and water. Flavors and nutrients from tea leaves extract well in water. That’s why a straight cup of tea tastes so good. That’s why people who like milk in their tea traditionally add the milk after the tea is brewed. A lot of other things, however, don’t extract quite as well. Many of the flavors in a masala spice blend (no, they aren’t chai spices — chai just means “tea” in Punjabi) are lipophilic. Directly translated, this means “fat-loving,” which means that they extract much better in fats (e.g., milk) than in water. That’s why it’s important to brew the masala chai in hot milk and water instead of just adding the milk later. 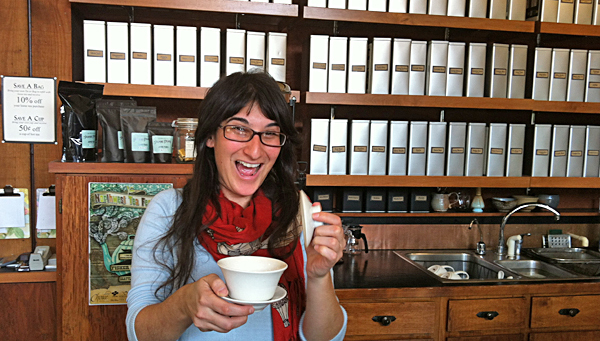 In my tea bar, we’ve done side-by-side taste tests of tea lattes made both ways. We use a milk heater/frother instead of using the steamer that’s found on commercial espresso machines. We tried steeping the tea in water and then adding the frothed milk vs steeping the tea in a 50/50 blend of hot water and frothed milk. In this entirely subjective set of tests using our employees and customers, the lattes brewed with milk won consistently. I realize that our production method wouldn’t work in a typical coffee shop where people are rushing in and out on their way to work. They want their drink now. They don’t want to wait four to seven minutes for a fresh-brewed cup. But in a tea bar like mine, things are different. We make a lot of lattes — close to 1/3 of all of the cups we serve. We offer a choice of milk (nonfat, 2%, whole, half-and-half, soy, almond…), and over 150 different types of tea. 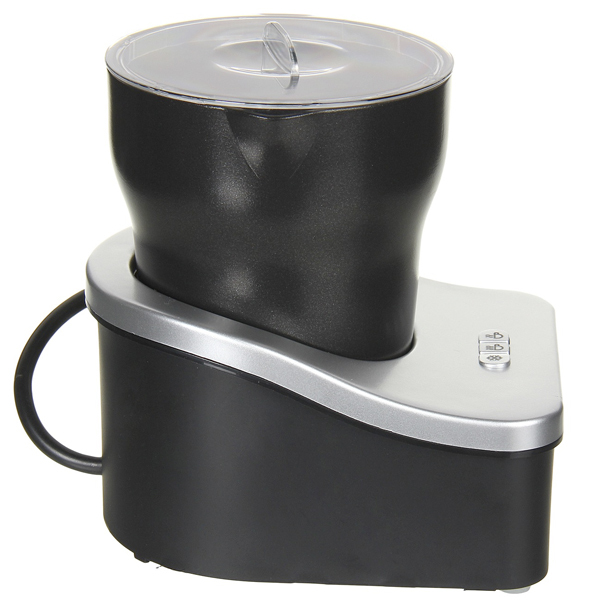 Capresso frothPRO milk heater and frother. The majority of our lattes are served unsweetened. For those who want it sweetened, however, we do the same thing we do when making traditional sweet tea: we add the sweetener when we’re brewing instead of at the end. Most of our customers go for either plain sugar or agave nectar, but we offer other options there, too: flavored hail sugars, honey, stevia leaf, stevia powder, and other artificial sweeteners. You can’t do something like this in a fast-moving production line environment, but you can do it at home. A milk heater/frother is less expensive than a high-end home coffeemaker. We started out with Keurig units, but found they didn’t hold up to commercial use. There were too many fragile parts, and most of them broke in the first six months (that Keurig unit didn’t even end up on this list of the top 10 frothers). We switched to the Capresso frothPRO and we’ve been quite happy with them. They aren’t the fastest solution, but they’re solid, reliable, and easy-to-clean. It’s also easy to switch between heating/frothing and just heating. If you don’t want to invest $50-$100 in a frother/heater, there’s another solution that works great at home. Just heat the milk in the microwave. Don’t let it go to a boil, but get it as hot as you can without boiling it. There are quite a few handheld battery-powered electric whisks available if you like it frothy; the list I linked in the previous paragraph includes three of them. How do you know which types of tea work best in a latte? Experiment. One of the most popular tea lattes is called a London Fog. It’s very straightforward: just Earl Grey tea and a 50/50 mix of milk and tea. We usually start the tea steeping in water and add the milk halfway through. Make sure you use the right amount of tea leaf for the total volume of milk and water; if you’re using 8 oz of milk and 8 oz of water, use enough leaf for a 16 oz mug. Many of our blends with cinnamon make good lattes, as do fruity teas. We use sweetened matcha powder for our green tea lattes. Want something different? Try making a strong shu pu-erh latte with chocolate milk. Experiment, have fun, and then teach all of your coffee-drinking friends just how many kinds of latte there are! If you haven’t already read Day 1: The Saga Begins, Day 2: Attack of the Clonals, and Tea Bloggers Roundtable, you might want to read them first for context. If not, that’s fine. Read on. No biggie. The third day of World Tea Expo 2014 started rather unexpectedly, as we pulled into the parking garage and encountered Harley Quinn. On roller skates. As we walked to the expo center, we met up with a variety of other comic characters — along with some characters from movie and TV shows. 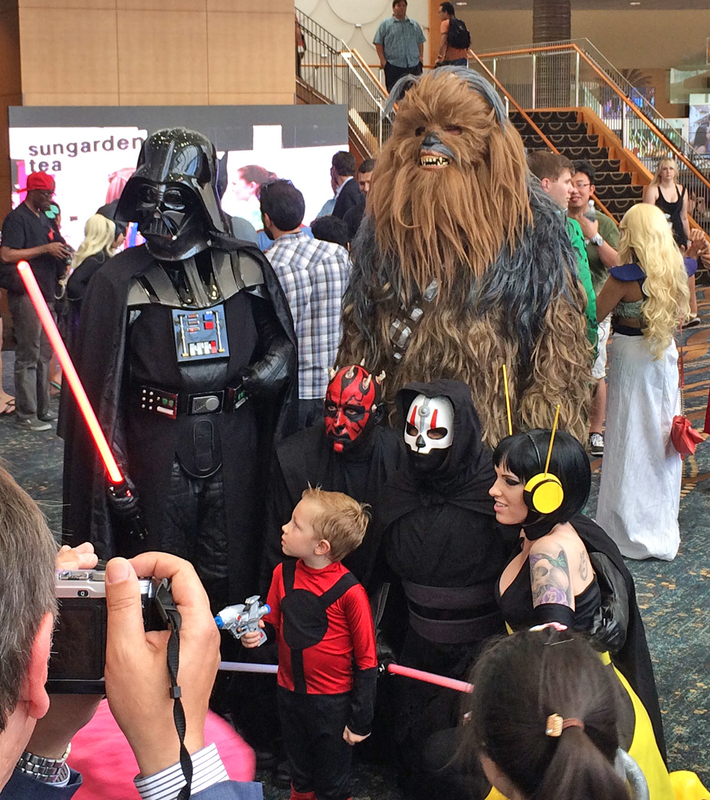 Yes, it was cosplay time at a comic book convention. Parked in front of the expo center, we saw a variety of vehicles: Kit from Knight Rider, three (Count em! Three!) Jurassic Park tour vehicles, the Back to the Future DeLorean, complete with a dead ringer for Doc Brown, and quite possibly the most awesome Batmobile I’ve ever seen. That wookie was BIG! I’m guessing he drinks a lot of good healthy Taiwanese oolong. Once we got past the Star Wars crowd, however, it was back to the business of tea. And most of that consists of placing orders on the last day of expo to catch all of the show specials. Most of what we purchased was pu-erh tea, which I drink a lot of these days. A good part of the reason we buy so much pu-erh at the World Tea Expo is that there’s a rich variety available, but it can be hard to find in the U.S. Looking for a nice first-flush Darjeeling? Every major tea importer or distributor has one. Sencha? There’s hardly a catalog without at least one. Earl Grey? Even grocery stores in Montana are likely to carry more than one. But if you’re looking for unique and tasty pu-erh teas, you just might have a long (and pleasant) task ahead of you. At World Tea Expo, there’s a broad variety of pu-erh laid out on tables all across the expansive show floor, almost all of it compressed into cakes of some form or another. 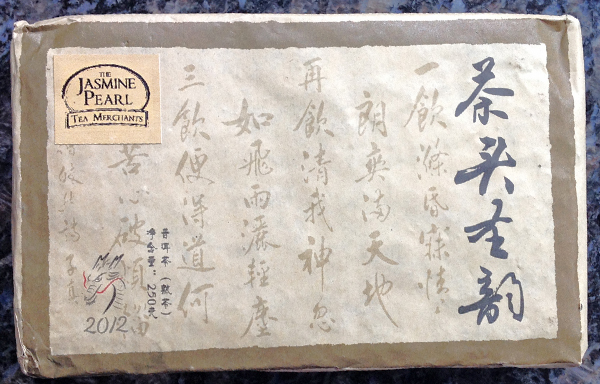 One of the most intriguing we came across this year is a jasmine sheng pu-erh. 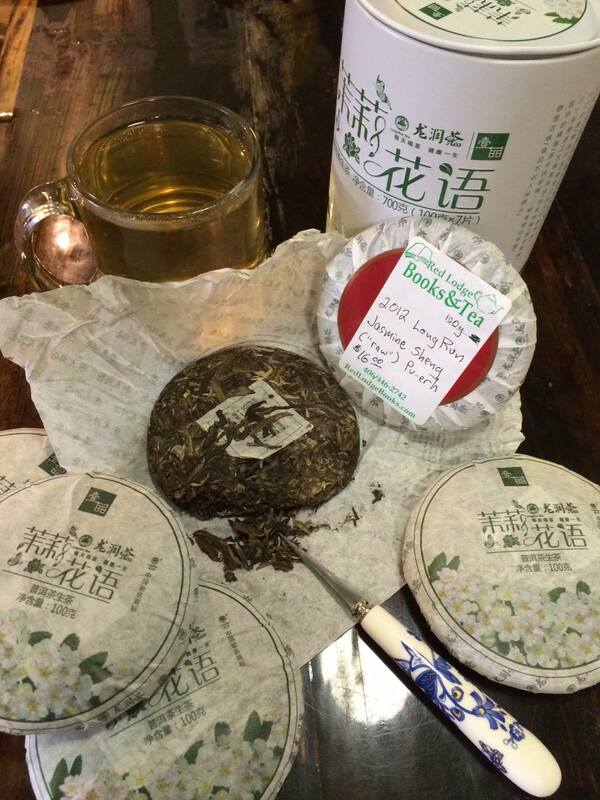 It has the same jasmine aroma that any Chinese green jasmine tea has, but the underlying flavor is much more robust. A touch of the expected pu-erh earthiness comes through, along with more astringency than most. Part of the astringency is explained by the relatively long steeping time that LongRun used in their booth. They steeped for about four minutes. When I got it home, I played around and decided two minutes is more my speed on this one. These are 100 gram beeng cha cakes, which are significantly smaller than the traditional 357 gram cakes. This also makes them more affordable for someone who’s experimenting. Yes, I can hear the faux gagging sounds coming from the purists, aghast at the idea of scenting a pu-erh tea. Pish tosh, I say to you. I’ll drink my straight pu-erh in the morning, but this lightly scented jasmine delight is just the thing for mid-afternoon. Also, being such a young fermented tea (2012), it will continue to get better and smoother for many years, aging like a fine wine. If you end up with enough self-control to put some away for five more years, it will be awesome! Two other interesting things about that picture: the color of the tea in the glass in the background, and the pu-erh knife in the foreground. 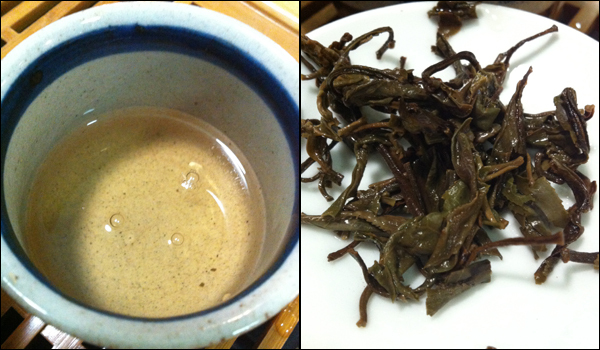 If you’re used to shu (“ripe”) pu-erh, which brews up very dark red, this pale green concoction will look mighty odd. I suppose if I wanted to really show the color, I wouldn’t have set it on a dark wood counter, but that’s beside the point. 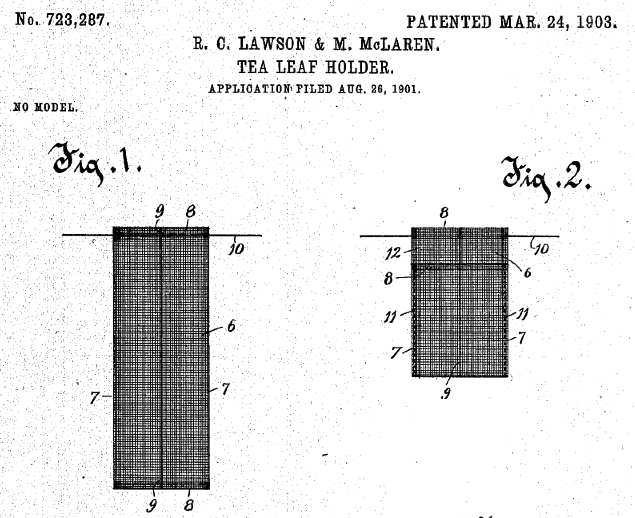 Sheng (“raw”) pu-erhs are much lighter and more delicate than the “in your face” shu pu-erhs. For breaking apart pu-erh cakes, you don’t want a regular sharp knife. Cutting it will tear the leaves. What you want is a pointed knife that will slide between the layers of leaves and flake them apart. This pu-erh knife, which they call a “needle,” has a very sharp tip and basically no edges at all. I also like the ceramic handle. In addition to the other pu-erh cakes we bought, my friend and fellow tea blogger Geoffrey Norman slipped me a little present: two “pu-erh” teas from different countries. I’ve talked about spelling of Chinese teas here before, so don’t let Geoff’s “puer” and my “pu-erh” throw you off. The transliteration from Chinese into English will never be perfect, and often you’ll find different translators spelling the same words in different ways. The spelling Geoff uses is how the town of Puer appears on most maps, so it may end up winning out eventually if we ever come to consensus, but until then I’ll stick with my way. There are fermented teas (pu-erh style dark teas) made in a number of places outside of Yunnan. In addition to the Taiwanese and Vietnamese I got from Geoff, I bought dark teas from Fujian and Anhui provinces, and I am carefully aging a Laotian beeng cha as well. 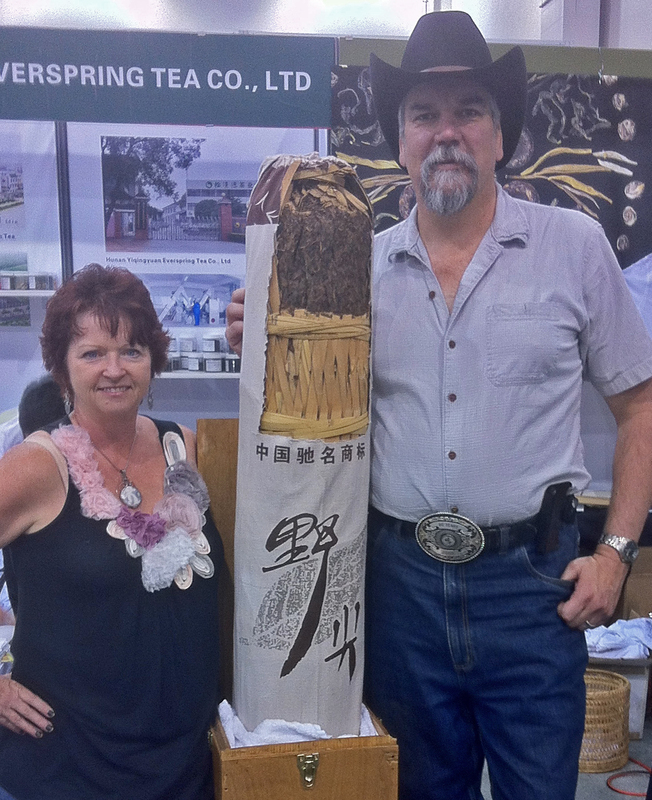 There is no other style of tea that has the variety pu-erh does. Some I steep for minutes, and some for mere seconds. Some brews so dark you can’t see through it, and some as light as a short-steeped dragonwell. The colors range from yellowish-green to orange to deep red. The flavors are all over the map. You can steep pu-erh leaves a dozen times, and each infusion will be different from the last. If you haven’t experienced pu-erh before, don’t blindly order some online. Go to a tea shop and talk to someone who really knows the style. Try several different ones to narrow it down. Only then, make the investment in a good pu-erh cake to take home and enjoy. (1) First, let’s start with how you were introduced and fell in love with the wonderful beverage of tea. I got my start with tea as a comfort thing when I was little. Any time I got sick, Mom’s immediate response was tea and toast. Tea relaxes me and makes me feel like I’m being taken care of. It was many years later that I discovered the amazing variety of beverages you can produce with the Camellia sinensis plant. There’s a lot beyond black tea in teabags and loose green tea leaves in the Chinese restaurant! (2) What was the very first tea blend you ever tried? I hereby define the word “blend” to mean a combination of ingredients, thus disqualifying Lipton teabags and the aforementioned green tea in the Chinese restaurant. That means the answer is “Morning Thunder” from Celestial Seasonings (tagline: The Awakening Power of a Thousand Charging Buffalo). I grew up in Boulder, Colorado, which is where Celestial Seasonings is based, so it was ubiquitous when I was in junior high and high school. Then, my junior year in high school I got a job driving a delivery truck for an office supply store, and Celestial Seasonings was one of my stops. (3) When did you start your tea blog and what was your hope for creating it? The first tea-related post I wrote on my other blog was in June of 2011, shortly after opening my tea bar. About four months later, I gathered all of the tea-related posts from that blog and split them off into a new one: Tea With Gary. That’s what you’re reading now. (4) List one thing most rewarding about your blog and one thing most discouraging. Rewarding: I have met some awesome people through tea blogging, and I feel like I’ve debunked some myths about tea. Discouraging: Where are my tens of thousands of screaming fans? Hey, no offense to the hundreds of readers I do have, but I had hoped for more after 2-1/2 years. (5) What type of tea are you most likely to be caught sipping on? I drink a lot of different kinds of tea, but the two I’m most likely to be drinking are Iron Goddess of Mercy oolong (a.k.a. Tieguanyin) and various shu pu-erhs. (6) Favorite tea latte to indulge in? When I make myself a tea latte, it’s almost always masala chai. I like a nice spicy chai with frothy milk, a dash of agave nectar, and a sprinkle of cinnamon on the foam. (7) Favorite treat to pair with your tea? A lightly-salted big soft Bavarian-style pretzel. (8) If there was one place in the world that you could explore tea culture at, where would it be and why? Oh, my, that’s a rough question. For tea culture, it would have to be Japan. When I was last there I hadn’t really explored Japanese tea culture and ceremony, and I’d like to go back now that I know a little bit about it. As for tea horticulture, I’d like to visit some tea plantations in either China or Kenya. (9) Any tea time ritual you have that you’d like to share? Unfortunately, I don’t take the time for ritual very often. Most of the time I’m making a quick cup to consume while I do something else. When I do observe a ritual, it really varies with the type of tea I’m drinking. I prepare and drink my pu-erh differently than my matcha, obviously. (10) Time of day you enjoy drinking tea the most: Morning, Noon, Night or Anytime? Any time. Any time at all. Being a bit ADD, the caffeine doesn’t affect me the same way it affects normal people. I do have a tendency to drink tea that’s lighter in the caffeine at night, though (e.g., houjicha), or even switch to rooibos. (11) What’s one thing you wish for tea in the future? That there’s never one single business and one single variety that reaches the levels of dominance that Starbucks has reached in coffee. I like tea being a different experience depending on where I go and who I’m with. I enjoy every tea shop having a unique atmosphere, a unique selection, and their own way of presenting the tea. Diversity is a great thing, and I want the diversity in the tea world to increase rather than decrease. My son, Doug, accompanied Geoffrey and I to the shop, and we entered to the wondrous smell of tea blending and brewing. We met the owners and several other staff members, and then settled in to browse. As I typically do when entering a new tea shop, I explored their tea list to see what they had available. They had the usual selection of flavored teas & scented tea (Earl Grey, Moroccan mint, jasmine pearls…) and old standbys (tieguanyin, English breakfast, gunpowder green…). They also had some very interesting-looking varietals and single-source teas, including kukicha, dong ding oolong, and Gaba oolong. After we looked around a bit, they informed us that tasting was free and pretty much everything was available to taste. One of the staff pulled out a couple of gaiwans, along with cups, strainers, and other related accoutrements, and asked where we’d like to start. Clearly, she loves her job! We started with the kukicha and dong ding oolong, and they were both good. The Gaba oolong, on the other hand, was an absolutely wonderful, and it has a great story behind it, too — but that’s for another blog post. After going through the oolongs, Doug chose to try his favorite, a lapsang souchong, and he ended up loving it. I, on the other hand, wanted to try pu-erhs. I asked her what was their richest, earthiest, most complex pu-erh. She immediately guided me to the Gold Nugget. Not to spoil the ending to this story, but I ended up buying some to bring home. 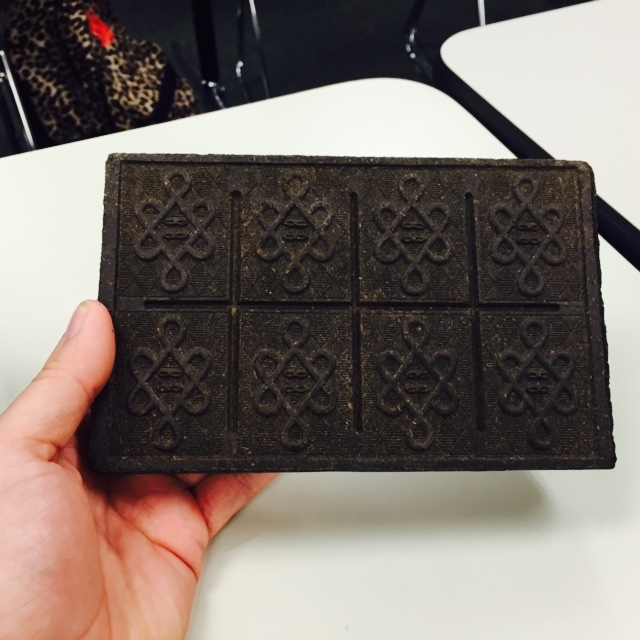 It looks like any other brick of pu-erh when it’s wrapped up like that, but when the wrapper comes off, it gets different. It seems that it has the name “Gold Nugget” for a reason. Some of the “nuggets” broken off from the cake. This is a close-up of part of the picture I used for the blog post header above. Most pressed tea is made with larger leaf varietals of Camellia sinensis, and the leaves are laid out rather randomly. This requires flaking off bits of the tea with a pu-erh knife or some similar implement. 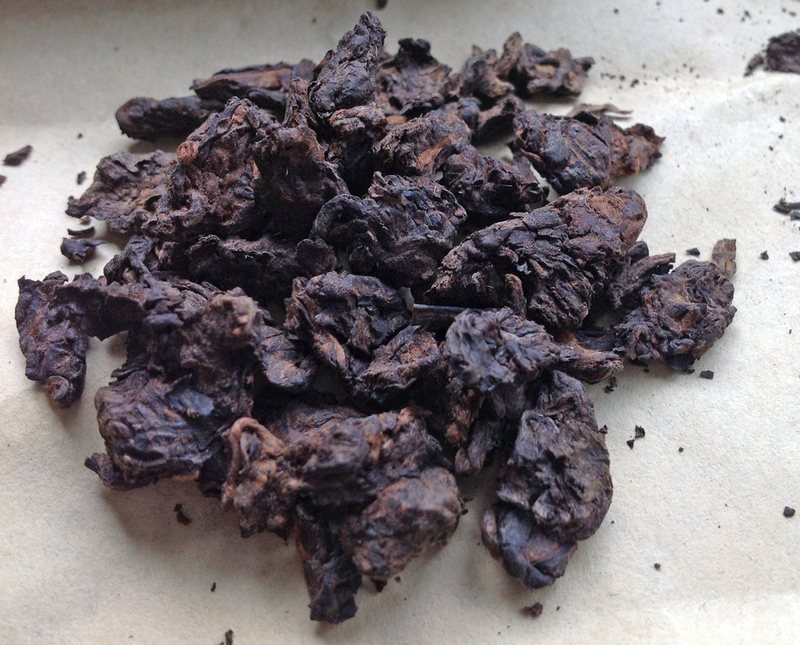 This shu (“ripe”) pu-erh uses whole leaves, but they are rolled up like an oolong or gunpowder tea first. These “nuggets” are then pressed into the cake. When I’m comparing tea, I like to keep the variables to a minimum. The little pile of nuggets in the picture weighs 7 grams. I put them in my infuser and did a 10-second wash with boiling water, which I drained out completely. Then I added 16 ounces of boiling water and let it steep for three minutes. To me, three minutes is a long steep time for a shu pu-erh. When I’m drinking my favorite pu-erhs, I usually go for more like 90 seconds. Our first taste of this in the tea bar, on the other hand, was steeped for five minutes, because I told her I liked it strong. I do, indeed, like it strong, but after steeping for five minutes, the flavors are rather muddled together. That’s why my first pass at home was for three. The result was exactly what I had asked for: rich and complex are great adjectives for this tea. 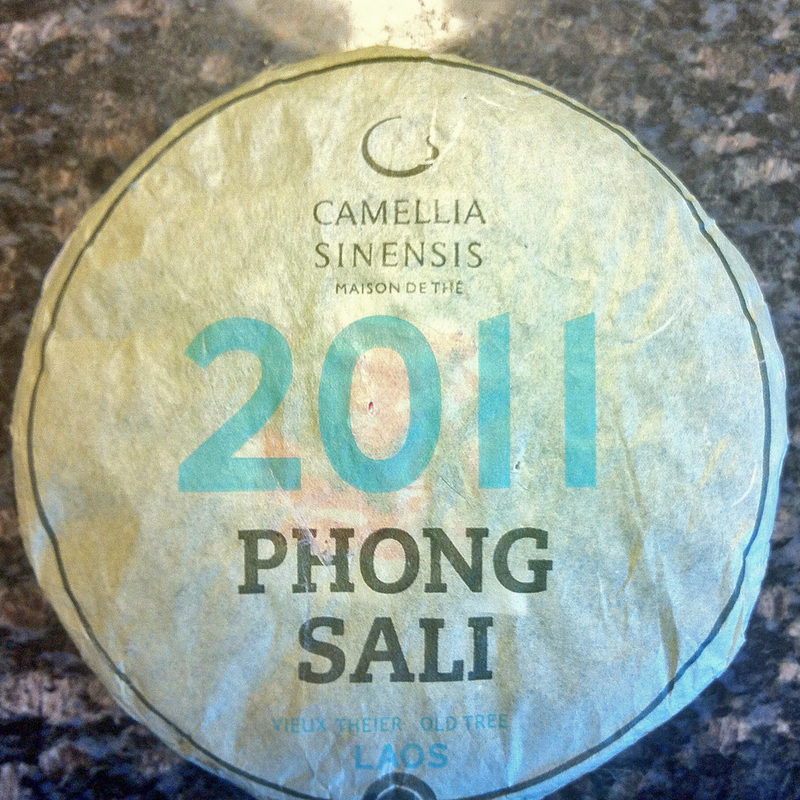 This is pretty much the polar opposite of the last pu-erh I blogged about. I will, however, be using longer steep times than usual for my first infusion, simply because those nuggets are rolled so tight that it takes a couple of infusions to open them up all the way. After steeping for three minutes, some of these leaves are still pretty tightly rolled. They do open more with each subsequent infusion, however. All in all, it was a great trip, and I came back with some great tea, lots and lots of autographed books, and some fond memories. After the tea tasting, we met my wife at a sushi restaurant and had some wonderful sushi rolls and interesting beers. I wouldn’t say Geoff knows as much about beer as he does about tea, but I think we’ll be having some future conversations about the differences and similarities in teas and beers. Tags: dong ding oolong, Doug Robson, Gaba oolong, Geoffrey Norman, Gold Nugget pu-erh, kukicha, lapsang souchong, pu'er, pu-erh, pu-erh cakes, shu pu-erh, sushi, tea and beer, The Jasmine Pearl, Who Pooped in the Cascades?